Tag Archive | "Jerry Jones"
Easy to quote but only a good quote with little evidence to further malign the Cowboys Owner. No one understands the frustration the Dallas Cowboys have put their fans through more than me, and Jerry Jones is an easy target to vent frustrations. Jerry does have a big ego and there are plenty of reasons to take shots at him, but the much quoted 136-136 record over the past 17 seasons sounds great as a criticism, but is a classic false choice fallacy. Stephan A. Smith is one of the loudest to beat this drum on his show “First Take.” Just how bad is the 136-136 record though? Take out the 3 straight 5-11 seasons under Dave Campo in which Troy Aikman got hurt the first game of Dave Campo’s career, the last game Aikman ever played, and the Cowboys record looks pretty impressive. Are people going to blame Jerry Jones for a team struggling initially after losing a quarterback of Troy Aikman’s caliber? Buffalo is 115-157 with two playoff appearances over the same 17 years. Detroit is 91-181 with three playoff appearances. These two teams are the only ones over the past 17 seasons that have both losing records and either fewer than the Cowboys four playoff appearances or no Super Bowl appearances. Oakland is 106-166 in that span and played in a Super Bowl. Cincinnati is 116-156 with four 10-win seasons and five playoff appearances over that time. Jacksonville is 131-141 with five playoff appearances, three 11-win seasons, and a 12 and 14-win season. Chicago is 132-140 with four playoff appearances that include two 13-win seasons and two 11-win seasons, two conference championship appearances, and one Super Bowl appearance, as well as seasons in which they won 9 and 10 games without making the playoffs. The Chiefs are 129-143, four playoff appearances, two 13-win seasons, and a 10-win season in which they did not make the playoffs. Arizona – 109-163; three playoff appearances, one Super Bowl appearance, one 10-win season with no playoffs. St. Louis – 116-155-1; five playoff appearances, two Super Bowl appearances, one Super Bowl Championship, and 14, 13, and 12-win seasons. Washington- 118-153-1; four playoff appearances, three 10-win seasons. Carolina – 125-147; five playoff appearances, one Super Bowl appearance, three Championship game appearances, three 12-win seasons and two 11-win seasons. Tampa Bay – 133-139; seven playoff appearances, one Super Bowl Championship, one 12, two 11, and two 10-win seasons, a 9 and 10-win season without a playoff appearance. Miami Dolphins – 135-137, six playoff appearances, three 11-win seasons, one 10-win season, and 10 and 9-win seasons without playoff appearances. The following are some teams that are better than .500 but not by much. San Francisco is 139-132-1 with seven playoff appearances, two 13-win seasons, three 12-win seasons, 11 and 10-win seasons, a Super Bowl appearance and three straight championship games. Atlanta – 141-130-1; seven playoff appearances, one Super Bowl appearance, two Championship game appearances, one 14-win season, two 13-win seasons, two 11-win seasons. Tennessee is 140-132 with six playoff appearances, a Super Bowl appearance, three 13-win seasons, 12 and 11-win seasons and a 9-win year in which they didn’t make the playoffs. Houston and Cleveland are both under .500 but have not played every season since 1997. Houston is 79-113 with two playoff appearances, and Cleveland is 77-163 with one playoff appearance and a 10-win season without making the playoffs. Here, I am shredding apart another weak narrative by ESPN with FACTS detailing what actually occurred. The Cowboys’ 136-136 record is not bad on its own and includes a horrendous span of three years following the loss of a Hall of Fame quarterback during which the team went 15-33. Yes, the Cowboys are only better than 15 of the 32 teams in the league over that span, putting them right in the middle. This would illustrate Stephan A. Smith’s point that The Cowboys are a “Walking piece of mediocrity.” Whether they are mediocre or not, however, is irrelevant; what is relevant is whether or not the Cowboys 136-136 record over that time is an indication that Jerry Jones is doing a poor job. The Cowboys are better than 11 teams that have been to the playoffs as many or more times than they since 1997. They have a better record over that span than two teams that won The Super Bowl (Tampa Bay/St. Louis) and three teams that made a Super Bowl (Chicago/Arizona/Carolina) appearance. Clearly, going .500 over 17 seasons in the NFL is good enough to be a contender for a championship. 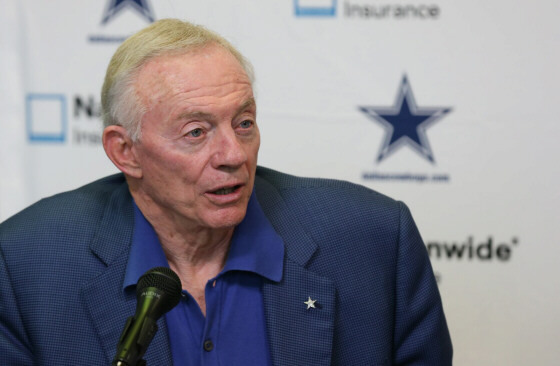 Judging Jerry Jones on the Cowboys’ regular season alone is a false choice. The overall regular season record over the last 17 seasons speaks to the parity for which the NFL so strongly strives and very little to the fault of the owner. It is time to stop using this lame argument to which I gave a halfhearted effort to destroy and did so in less than an hour. Plenty of things illustrate the faults of Jerry Jones, no need to pile on him with a weak argument when there is plenty else from which to choose.